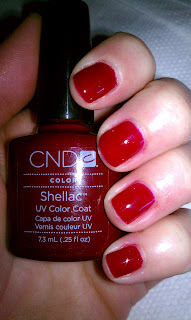 I chose CND Shellac Decadence for my holiday nail color. It's a lot brighter than what it looks like in the bottle. It's a pretty 'Christmas' red, more warm, unlike Hollywood or Wildfire, which are cooler toned reds, more like '4th of July' reds. I just purchased Masquerade and Fedora at the beauty supply store. Swatches to come soon!